Their use is strictly tied to concrete works. There are no small or large structures without the use of these absolutely necessary products. 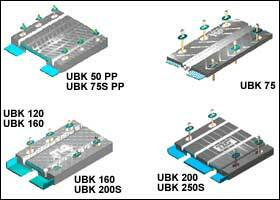 The choice of the type and especially the measuring are the main factors that mark these materials. They are fabricated with rubber with reinforcing steel plates. They may be fixed, mono-directional, multi-directional. They may have the external face made by rubber layers (they will be fixed to concrete structures by using cement and/or epoxy mortars) or by steel plates (fixed by bolts). Their size will depend on factors like dead and live loads as well as thermal action. They are manufactured by rubber and steel in a way to make a solid but elastic junction between two concrete walls. They are connected to the paving by means of threaded bars poured into the slab and fixed by stop-nuts and epoxy resins. The anchorage system will allow to make repairs from possible damage or wear and tear of some parts in a quick way without compromising the flow of traffic.